When it was released in 1989, the original Game Boy was already running on an outdated chip, and the green, 4-colour screen was behind what was possible at the time. However, the Game Boy overcame its shortcomings and remained the unchallenged portable game system of choice for over a decade. During this time, it underwent numerous hardware improvements and received a number of important accessories, such as the Link Cable and Game Boy Camera. The Game Boy line used three serial codes on its hardware. The original Game Boy used DMG (Dot Matrix Game), the Game Boy Pocket and Light used MGB (Mini Game Boy) and the Game Boy Color used CGB (Color Game Boy). The original model Game Boy was the first successful portable videogame system. The price was kept low thanks to the 4-colour green-tinted screen and the basic chipset. The system was usually packaged with Tetris or Super Mario Land, two of the highest-profile games on the handheld. 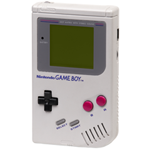 The Game Boy took four AA batteries, or an optional Rechargable Battery Pack was available. Sound was played through a small speaker on the bottom-right of the system or through the headphone jack. A set of headphones were packaged with each Game Boy. A remodelled Game Boy, released in 1996. The Game Boy Pocket was smaller and slimmer than the original model, and featured a sharper screen than the original model. Power consumption was also reduced, requiring just two AAA batteries for 8 hours of continuous play. 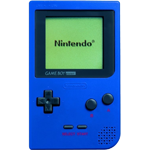 The Game Boy Pocket was originally released in 5 colours (gray, red, yellow, green, black), with a further 4 made available before the end of 1997 (silver, gold, pink, clear purple). A number of limited edition colours were also available in different regions. A remodelled version of the Game Boy Pocket, released only in Japan in 1998, and featuring a backlit screen. The system was powered by 2 AA batteries, providing 20 hours of play with the backlight off or around 12 hours with the backlight on. 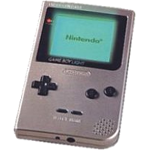 The Game Boy Light was available in Gold or Silver, or in a number of limited edition colours. Because the Game Boy Light was launched close to the release of the Game Boy Color, it had a short lifespan. As a result, it has become something of a collector's item. 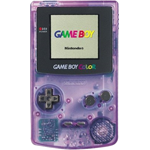 Following pressure from developers, Nintendo launched the Game Boy Color in 1998. The machine was capable of playing bigger and better-looking games than its predecessors, and could display in a full 8-bit colour palette. Black cartridge games would play on all models of Game Boy but would feature special colour palettes or even exclusive content when played on a Game Boy Color. Transparent cartridge games would only work on the Game Boy Color (and later the Game Boy Advance). If inserted into an earlier model, the games would often display a warning message. The Game Boy Color was also compatible with all earlier Game Boy games, and could even display customised colour palettes. The Game Boy Rechargable Battery Pack allowed the player to either charge up the battery using a power socket, or to use the Game Boy while it was connected to the power socket. A similar Battery Pack and AC Adapter were made available for the Game Boy Pocket and Game Boy Light, which were also compatible with the Game Boy Color. The Game Link Cable allowed for multiplayer gaming by connecting two Game Boys, each containing a copy of the same game. Many of the games in the Game Boy library made use of the Game Link Cable, with Tetris and the Pokémon games being the most famous. When the Game Boy Pocket was released, it had a different connector for the Game Link Cable, so a number of adapters and universal cables were released to allow different models to play against one another. The Four-Player Adapter allowed up to four Game Boys to connect with each other to play games with 4-Player modes available. In order to do this, each player would need a Game Boy, a Link Cable and a copy of the game. As a result of the expense required, very few games made use of the Four-Player Adapter. Released in 1998, the Game Boy Camera was a Game Boy cartridge with a camera on the top. The Game Boy Camera software allowed the player to take 4-colour photos using the Game Boy, edit, trade and print them, and even use the player's face in several built-in games. Despite its simplicity, the Game Boy Camera was extremely popular, being one of the first massmarket digital cameras available, and for a low price. In 1999 it received the Guinness World Record for smallest digital camera (a record it no longer holds). 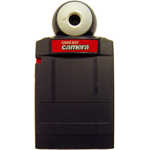 For more on the software, see the Game Boy Camera game page. 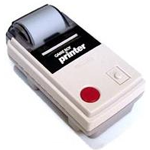 A printer, released alongside the Game Boy Camera, that allowed images to be printed onto adhesive thermal paper. As well as photos from the Game Boy Camera, the printer was made compatible with a number of other games. Pokémon Card GB2: Team GR is Here! 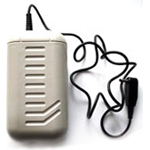 An adapter that allowed a Game Boy or Game Boy Advance to network with other Game Boys by connecting to a mobile phone and using it to communicate with the Mobile Service GB, providing an early form of online play. 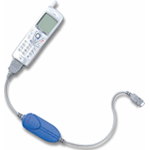 Mobile Service GB was only available for a short time, and was discontinued in December 2002.